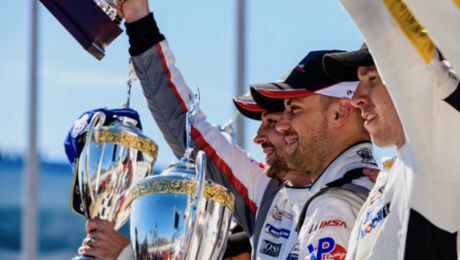 With the six-hour race at Watkins Glen on 2 July the IMSA SportsCar Championship picks up pace again after taking a break for the 24 Hours of Le Mans. The Porsche GT Team sends two new 911 RSR to contest the event in the US state of New York. The racer, designed from scratch by Porsche Motorsport in Weissach based on the seventh generation of the iconic 911 sports car, tackles the strongly represented GTLM class. In the GTD category, customer teams campaign the Porsche 911 GT3 R. The Porsche squad travels to Watkins Glen as the leader (driver and team) of the North American Endurance Cup. The other three events that make up this prestigious long-distance reliability competition are Daytona, Sebring, and Petit Le Mans. The storied Watkins Glen International racetrack, nicknamed “The Glen”, is 5.472-kilometres long. It was built around a forested hilltop and opened in 1956. For many years, Watkins Glen hosted Formula 1: From 1961 to 1980, the United States Grand Prix was contested on the outskirts of this tranquil town, with Jim Clark and Graham Hill at the top of the winner’s list with three victories each. 2015 marks the last Porsche victory at Watkins Glen courtesy of Wolf Henzler and Bryan Sellers in the 911 RSR. Patrick Pilet (France) and Dirk Werner (Germany) share the cockpit of the #911 Porsche 911 RSR. Manning the #912 vehicle are Laurens Vanthoor (Belgium) and – as his maiden race as a Porsche works driver – Gianmaria Bruni (Italy). 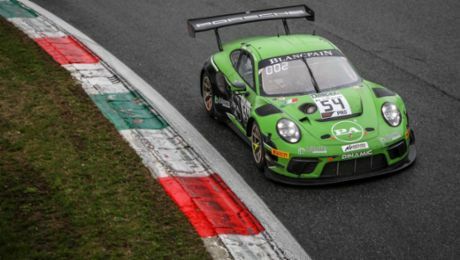 Fielding the 911 GT3 R in the GTD class are the customer squads Park Place Motorsports with Jörg Bergmeister, Alegra Motorsports with Michael Christensen as well as CORE Autosports. As a completely new development, the 911 RSR celebrated its race debut in January 2017 at the Daytona 24-hour race. It is campaigned by the Porsche GT Team in both the IMSA SportsCar Championship and the Sports Car World Endurance Championship WEC. Depending on the size of the restrictor, the motor, which is now positioned in front of the rear axle, puts out around 375 kW (510 hp). The level of downforce and the aerodynamic efficiency were significantly improved. The 911 GT3 R, mounted with the new ultra-modern, four-litre, flat-six engine with direct fuel injection, was designed by Porsche for worldwide GT3 series on the basis of the 911 GT3 RS production sports car. The 368+kW (500 hp) customer sport racer celebrated its first 2017 victory at Daytona. The six-hour race takes off on Sunday, 2 July, at 10.10 hrs local time (16.10 hrs CEST) and can be viewed live outside the USA on www.imsa.com. The IMSA SportsCar Championship is a sports car race series contested in the USA and Canada, which was run in 2014 for the first time. The series was formed from the merger of the American Le Mans Series and the Grand-­Am Series. Sports prototypes and sports cars start in four different classes: GTLM (GT Le Mans), GTD (GT Daytona), P (Prototype) and PC (Prototype Challenge). The new Porsche 911 RSR runs in the GTLM class, with the Porsche 911 GT3 R contesting the GTD class.